Roger Rosner, VP of Applications at Apple, introduces Apple News+ at Apple Park. Among America's established daily periodicals, only The Journal and the Los Angeles Times agreed to participate in Apple News+, a for-pay news-as-a-service product that launched with iOS 12.2 today. For publishers, including subscription-based websites, Apple News+ poses something of a dilemma. Integration in the product promises access to Apple's massive installed user base — 1.4 billion active devices as of January — at the cost of what are reportedly less than copacetic contract terms. 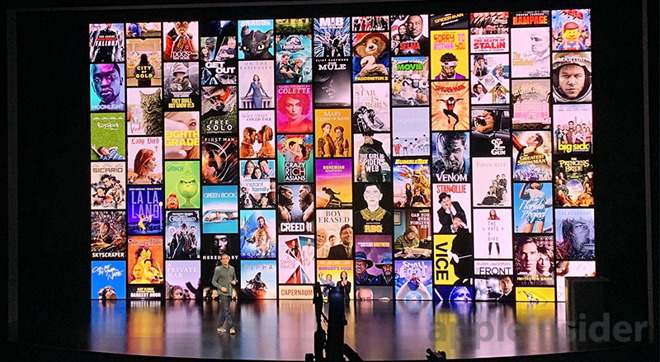 While Apple did not reveal specifics at today's unveiling, previous reports claim the company is demanding a 50 percent cut of Apple News+ revenue on a rate of $9.99 per month. Remaining funds are said to be evenly doled out to participating publications. Those figures are for many publications a substantial downgrade, especially those who distribute content through first-party platforms. The New York Times, for example, charges $15 per month for access to its stories, while The Journal itself charges $39 a month. William Lewis, publisher of The Journal, is willing to throw in with Apple, saying he believes Apple's news product will help reach new readers, reports Business Insider. More importantly, he does not believe Apple News+ will cannibalize existing subscriptions. "It's an era of product segmentation," Lewis said. "So there are millions of people that will continue to want to become Wall Street Journal members and have the full offering that centers on business and markets and finance and hard-core politics ... but there's also millions that will be attracted to a slightly different offering ... that's more snackable." As for cannibalization, the WSJ has something of an ace in the hole, as only select content will be made available to News+ subscribers. "Is all our content going on Apple News?" Lewis said. "No. We're going to make sure the Apple News product is a wonderful product people feel comfortable investing in." While WSJ editor Matt Murray is in charge of dictating what content makes it onto Apple's service, Lewis guesses the selection will be a mix of general, political and sports stories. That theory is borne out in the publication's offerings available in Apple News+ today. The Journal's decision to partner with Apple breaks with industry stalwarts The New York Times and The Washington Post. Last week, Mark Thompson, CEO of The Times, in an interview cautioned against distributing first-party content through third-party services. "We tend to be quite leery about the idea of almost habituating people to find our journalism somewhere else," Thompson said. "We're also generically worried about our journalism being scrambled in a kind of Magimix (blender) with everyone else's journalism." He went on to liken a deal with Apple to agreements film and television production companies struck with Netflix when the one-time DVD rental company forged the beginnings of what would become a massive digital streaming market. The result, at least for Hollywood studios, was decreased bargaining power and the creation of a segment competitor. Apple News+ is available now for devices running iOS 12.2 and later. For $9.99 per month, users are granted access to more than 300 magazines, as well as newspapers and websites, with custom curation and AI-driven recommendations. Like Apple Music, Apple is offering a free trial period, which for News+ includes a month of service. Update: In its own announcement of the partnership, The Journal clarified that all business and financial news will also be searchable in the News app, though users only have access to three days' worth of archives.